Let’s face it, week night meals sometimes just don’t come together the way we plan and for those hectic nights we need easy 5-minute recipes like this delicious hummus. I admit it, I have absolutely no qualms with feeding my family a plate loaded with raw veggies, crackers, and mounds of homemade hummus. Honestly, I think they actually look forward to it! It’s hearty, delicious, and healthy. You just can’t beat that combo. You only need to keep a handful of ingredients on hand for the most basic of hummus recipes, but feel free to doctor up if you’re feeling a little more adventurous. 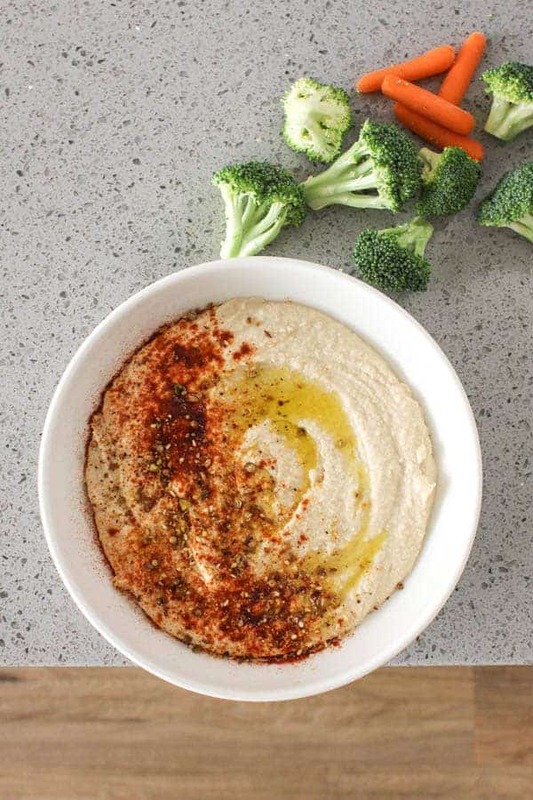 Use this homemade hummus as a dip for crackers, a spread for sandwiches and wraps or even thinned with more lemon juice for a delish hummus dressing! Combine the chickpeas, tahini, garlic, lemon juice, water, and salt in a blender and blend until smooth. If needed add more water a tablespoon or two at a time to thin to desired consistency. taste and season adding more salt if necessary. Serve topped with desired toppings. woww…I usually prefer less time-consuming food while making it. Thanks for sharing and I’m sure it’ll taste great.